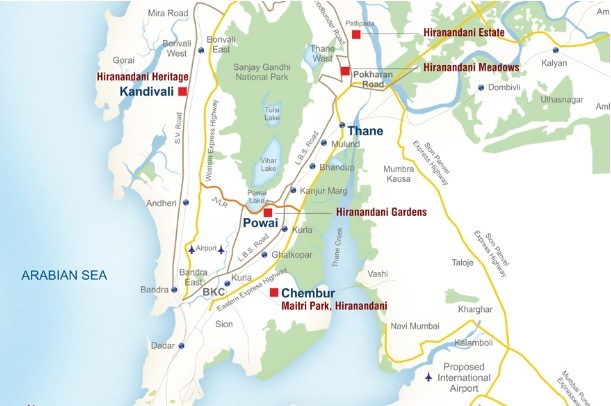 Rodas Enclave is not just another attempt by Hiranandani to give Thane with one more residential township. In fact, it is the harbinger of a new era of living and lifestyle in Thane.Rodas Enclave will give the concept of spacious living a formidable shape and new dimension. While all the towers would be built on podium garden, the apartments won’t just be smarter in looks but larger in size too. The Group is known for its projects of Hiranandani Gardens, Powai, Hiranandani Meadows, Thane, Hiranandani Estate, Thane, Hiranandani Business Park Powai & Thane. It has 18 majestic buildings of 18, 24, and 28 floors, lavish 2, 3, 4 and 5 BHK apartments, a floating clubhouse, a magnificent green zone, numerous avenues of recreation and entertainment all of these perched on an elevated podium. Add to this the amenities offered by an integrated township and it becomes a good option. Patlipada was the village located on Ghodbunder Road, Maharashtra state in India. It is now a part of Thane city. Now this small village has grown into a most promising place with major Residential Complex and Official Residence of Thane Municipal Commissioner located in this area. Patlipada is Located on the Ghodbunder Road which is 6 – 7 km away from the Thane Railway Station. As Patlipada was Village mostly land was covered with agriculture fields and quite near to the National Park. Now this has changed the village is transformed into a town and it can be said that it is in competition with the main Thane City itself. The project boasts of excellent social infrastructure in forms of schools, malls and shopping centres. This location has a Walk Score of 62 out of 100. This location is Somewhat Walkable so some errands can be accomplished on foot. Nearby parks include Nisarg Garden, Nisarg Garden and Hiranandani Park. Nearby schools include Arun Muchhala Inst Of Hotel Management And Catering Tech, Dr. Ashok B. Karnik and New Horizon Scholars School & Neo Kids.The closest grocery stores are Bhankharia Tea Stationery & General Stores, Hypercity and Vagheshwari Kirana Store. Nearby coffee shops include Cafe Coffee Day - Hypercity, Ghodbunder Road, Pet Puja and L.K. Caife & Foods. Nearby restaurants include Dominos, Dominos Pizza and Kailash Dairy Farm & Restaurant. The layout though not an even shape is still planned to utmost perfection. Most of the apartments will get views of the garden and the clubhouse (a separate clubhouse for exclusive for Rodas Enclave residents). 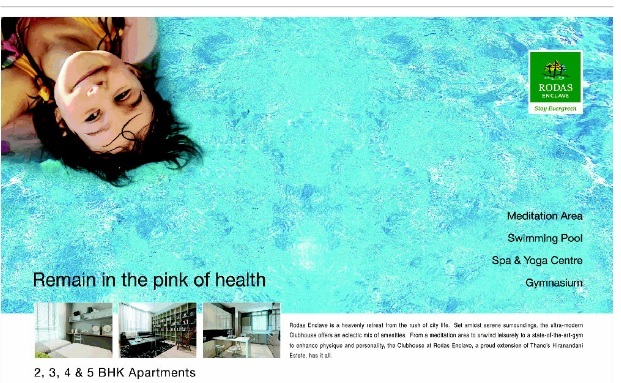 In terms of external amenities the product has it all, The only hitch is there are almost 18 towers in the plot. A little overstuffed? Privacy in some apartments might be compromised. There are 18 different set of floor plans and it will be difficult to evaluate them all, so we have randomly picked up a typical floor plan in Bankston; let's see what the product has to offer.Y-shaped tower, a big advantage since there are no common walls and the apartment gets cross ventilation and natural sunlight. There are 2 variants of 3 BHKs.Flat 1 & 2: The apartment has a foyer which opens up into the living room (ensuring privacy in the apartment). A spacious 21 * 12 living dining space with an attached deck ensures luxury! Bedrooms sizes of 15 * 11, 13 * 11 & 12 * 11 ensure you have enough room in your living space. Flat 3: These apartments come with similar bedroom sizes. The only difference is that you enter into a grand living dining space which further extends to the deck area.Overall these are well planned efficient apartments. If you are an end user this project is a winner, the range of choice begins from 2 BHK to 5 BHK, all bigger by measure than the standard norm. There are 18 towers in the project. The project has excellent location and boasts of top of the line amenities that come with an integrated township. Although it is being sold at a premium to the market, it comes with the concept and the brand name of Hiranandani. 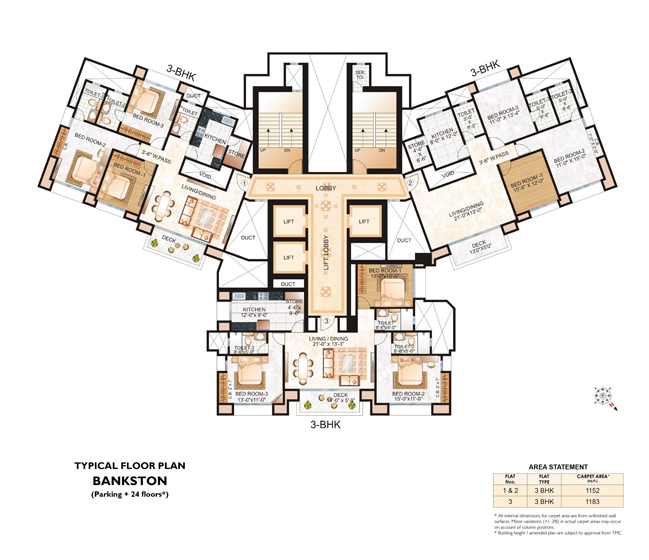 Buyers should look at individual floor plans before their final decision and location of individual towers in the overall complex. If you are an investor with a horizon of 5 to 8 years - Look at options closer to Balkum & Majiwada, kalpataru and Lodha are coming up with township products here.